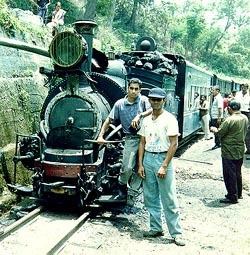 This shot was taken on my first trip to Darjeeling in 1993.....sporting the cap is my school pal Utsav and on the engine is me (Bharat)! 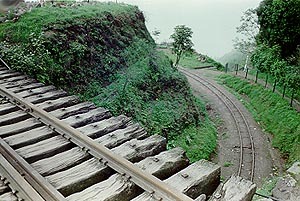 This was a scheduled watering halt for the up service to Darjeeling...about half way up! Loco in charge is No.790 (NBLC built). The Darjeeling Himalayan Railway is one of the most well known hill railways in the world...and a delight it is!! 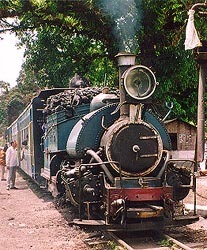 The Darjeeling Himalayan Railway (DHR) was built in 1881 and is over a hundred years old today. It connects the plains of West Bengal at New Jalpaiguri with the popular hill station of Darjeeling (6812 ft), a distance of about 50 miles. On the way it passes the most breathtaking scenery and climbs to a height of 7400 feet at Ghum (the highest station on IR & the 2nd highest station in the world), where on a clear day views of Mt. Kanchenchunga can be had. The DHR has been served by little 'B' class 0-4-0 ST's (Saddle Tanks) throughout its existence. Other locos that have worked the line here are the 'A' class and a Garrat loco as well. The B class, which are probably one of the oldest working steam locos in the world, were built by the North British Locomotive Company (NBLC, Glasgow), Sharp Stewart, Baldwin and a few at the DHR works at Tindharia itself. The DHR secured "World Heritage Status" in 1999. This 2'ft gauge narrow gauge concern is a must for all railway enthusiasts! Here is a collection of some of the snaps taken by Siddharth Joshi and me during our visits there over the past few years......enjoy! Close up view of the driving cab......NBLC built No.805. The firebox can just about be seen!! The 'B' class locos have just about enough standing place for one person, but in reality staff on the loco is about 6! One driver, one assistant, one fireman (! ), one coal breaker and two sanders...for braking downhill and to prevent slipping while going uphill! The main shed for the locos is at Tindharia, which is also the location of the carriage & wagon and loco shops for the DHR. The railway also has outstation sheds at New Jalpaiguri (NJP), Kurseong and Darjeeling! The complete 'Toy Train' standing at NJP station for the early morning departure. Loco shown is No.797. The morning service to Darjeeling is a connection for the Sealdah-NJP Darjeeling Mail which arrives at 8:15 am at NJP. To the left of the picture are the BG platforms and to the right of it are the MG platforms!! The NG station is squeezed in between! There are a total of 10 platforms in NJP...5 BG, 3 MG and 2 NG...most of them are never used! New Jalpaiguri also has the distinction of being the only triple gauge station left in the country and one of the last few left in the world!! 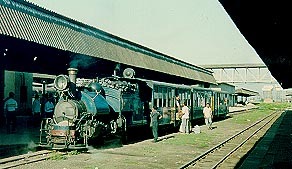 No.805 stands at the head of its train at Sukna station! Sukna is where the plains end and the ascent starts! Sukna is also the watering point for the little 'B' class powers! It also happens to be a Brigade Headqaurters for the Indian Army.....and is one of the most beautiful cantonments I have seen!! 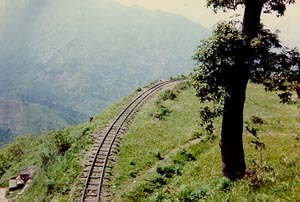 The DHR climbs from the plains to a height of 7400 ft at Ghum and then descends to 6812 ft at Darjeeling. The steepest gradient on the line is 1 in 20 and the average is about 1 in 29! The sharpest curve on the line is at mile 21 and has a radius of 59 feet!! The DHR doesnt have a single tunnel, unlike most hill railways, but employs the unique system of loops and Z's. It has 3 loops and 5 Z-type reverses in it. The most famous of all loops is the Batasia loop which is between Ghum and Darjeeling stations.....from here the Kunchenchunga can be seen on a very clear day! The photo shows the loop.....the track above...finally becomes the track below (or vice-versa) by 'looping' itself!! 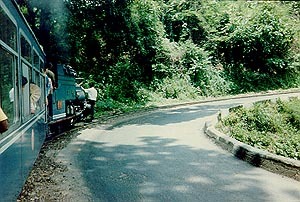 Another loop on the way to Darjeeling! Loop No.3, also known as 'Agony Point'. This picture was taken by me, while on the train and shows the section of track our train had just covered before climbing (looping) over it!! 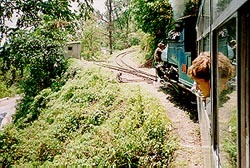 This is an example of the train negotiating one of the Z-type reverses enroute to Darjeeling! The engine has just pushed the train in reverse up the incline and is waiting for the points to be switched to pull it up the incline again!! To the left of the picture is a 'pointsmans hut' hidden by the tree!